A handsome pair of California design tables. 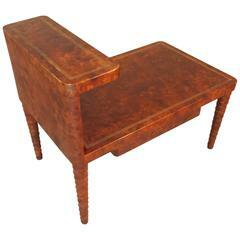 Made of solid walnut with a nice grain and inlaid oak wood top design. They've been lightly refinished to their original natural hues. Solid butcher block oak table with smoked glass shelf and wine storage. Finished on both sides with drawer on the front. Smart and understated midcentury walnut table with contrasting aluminum trim. Warm tone and lovely grain. Model number 487. Manufactured in Grand Rapids, Michigan by Calvin Furniture. Pair of John Stuart teak nightstands or end tables. Single drawer on four tapered legs, circa 1960-1965. Solid birch or maple construction designed by Paul McCobb. Aluminum 'O' ring pull. Very good condition. Unsigned.